It's three from three for Damian McErlain and Derry after victory in Fraher Field. 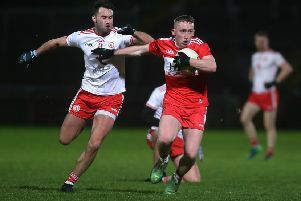 Despite finishing with 13 men, a resilient Derry made it three Division Four wins out of three after a well-earned seven point win over Waterford in Fraher Field on Sunday afternoon. The Oak Leafers trailed 1-08 to 1-07 mid-way through the second half but in a dramatic final quarter they hit six consecutive scores, including Paul McNeill’s crucial 67th minute goal to seal the win. The victory was made all the more remarkable for 13-man Derry who lost both Jason Rocks and Conor McAtamney to second half red cards but still managed to dig deep and return north with a victory that moves them on to six points. There was little to separate the two sides at the break with the Fraher Field scoreboard reading 1-05 apiece. Derry controlled the game and kept possession of the ball for large swathes of the opening 35 minutes but found Waterford’s heavily manned defence a tough nut to crack. The home side, however, with a strong breeze at their backs were much more clinical in their limited number of attacks. Sean Barrett ghosted in for his side’s only goal of the game in their very first foray forward in the 11th minute to hand the hosts an early 1-0 to 0-1 lead. Christopher Bradley reduced the Derry deficit to just one point soon after before a run of three consecutive points stretched Waterford’s lead to 1-3 to 0-2 after 20 minutes. Derry, nonetheless, enjoyed the better run in to the break. Niall Toner, in for the injured Enda Lynn, converted a mark which Sammy Bradley followed up with a free to leave Derry two adrift. 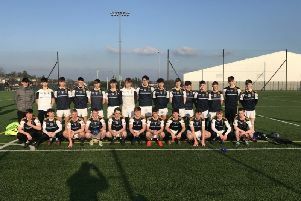 Points from Conor Murray and Jack Mullaney then handed the home side a 1-05 to 0-04 advantage after the 30 minute mark. the Waterford lead to leave it all square at the interval. The Oak Leafers would have expected to push on after the break with the icy cold wind now at their backs, but they found themselves a point down after the third quarter. But with the gun to their head, Derry produced their best football of the season. Conor McAtamney’s introduction proved the catalyst for the visitors' melioration. The Swatragh man horsed over a monster point with the outside of his right foot in the 59th minute. Christopher Bradley then chipped in his third point of the season as Derry took the lead for the first time since the opening point of the game. However, just when Damian McErlain’s side looked in pole position for victory, disaster struck. Red cards, as harsh as they were inexplicable, for both Jason Rocks (62nd minute) and McAtamney (65th minute) threatened to derail Derry’s unbeaten start to the season. To their great credit, the visitors kept cool and simply tapped on the accelerator for home. Top scorer McGuigan swung over two further points, before club mate Paul McNeill palmed home Derry’s second goal in the 67th minute, after a lung-bursting run from Niall Toner. Substitute Enda Lynn’s late score confirmed victory for impressive Derry who move to the top of Division Four.